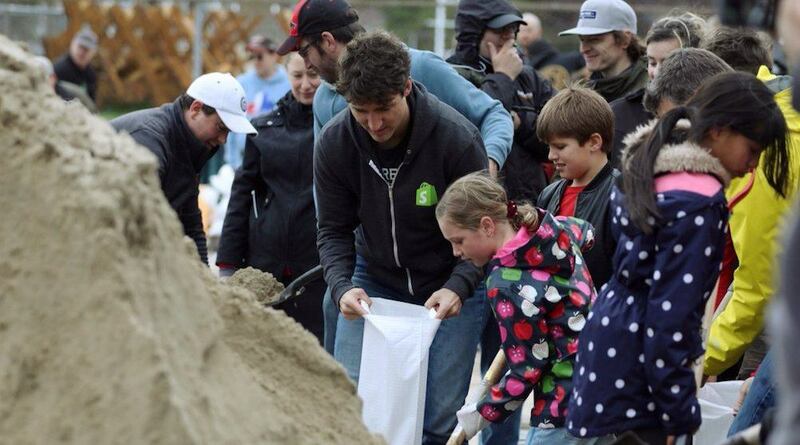 After the City of Montreal declared a state of emergency on Sunday, Prime Minister Justin Trudeau went to visit and help out at some of the areas affected by flooding. With approximately 180 homes evacuated and 400 Canadian soliders brought in to help the struggling city, Trudeau lent a helping hand in the front lines in the community of Terrasse-Vauldreuil. “Friends & neighbours, civilians & soldiers coming together to help those affected by floods. Inspiring to see it in Terrasse-Vaudreuil, QC,” he tweeted on Sunday. Montreal was one of several eastern Canada regions affected by flooding. Ottawa and Toronto were also hit with floods after days of rain. And the weather is predicted to stay wet in Montreal, with snow in the forecast for Monday.